Women often struggle with makeup when they go on travel. There are several approaches to travel makeup. No Makeup – Some women take a break from their makeup when they go on vacation. They only take moisturizer and face cleanser. This method works well for adventure travel or any destination where there is a lot of humidity and sweat. It also works well in countries where women don’t have access to a lot of makeup and you want to blend in. Minimalist – The minimalist look usually consists of using a tinted moisturizer and one other product, either mascara or lip color. This is a casual/daytime look. It works best on trips where exercise is minimal or medium intensity, and there is no need to get dressed up. Full Face – Many fashionistas wouldn’t be caught dead without their makeup, even in the middle of the African bush. This look is possible even when one-bagging, but it requires pre-planning and a bit of sacrifice. 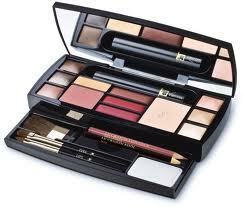 This makeup palette from Lancome is an expensive but convenient way to carry makeup. Another option is to create your own palette using something like the Unii Makeup Palette. This works well if you like to use a lot of solid products. Z-palette sells a less robust version of a do-it-yourself palette. I use a lot of liquid makeup, so I decided to create my own travel makeup kit. It stays in my purse full-time. This makes it easy to pack for a trip – my makeup is ready to go. 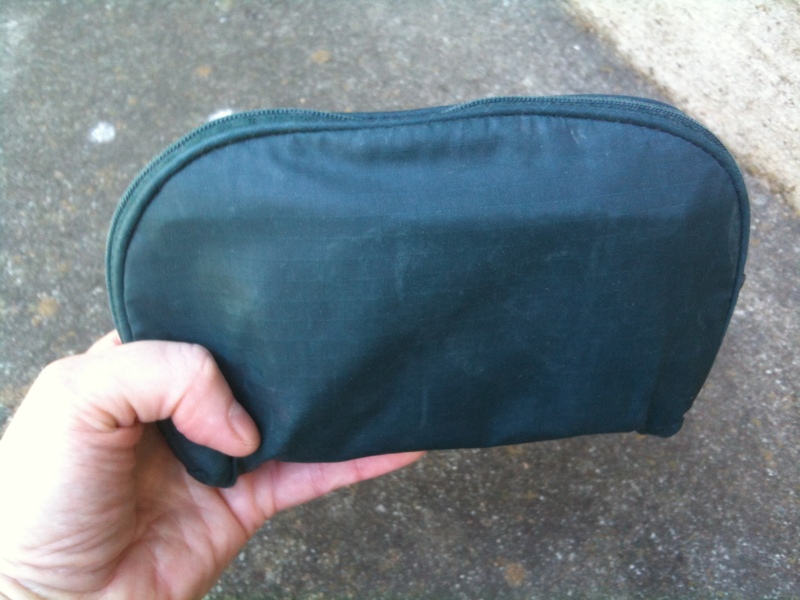 The purse kit has approximately 2-1/2 weeks worth of product within it. When I leave for a trip I just top off my products, separate out the liquids, and put the kit in my suitcase. My small travel makeup kit is also my purse makeup kit. 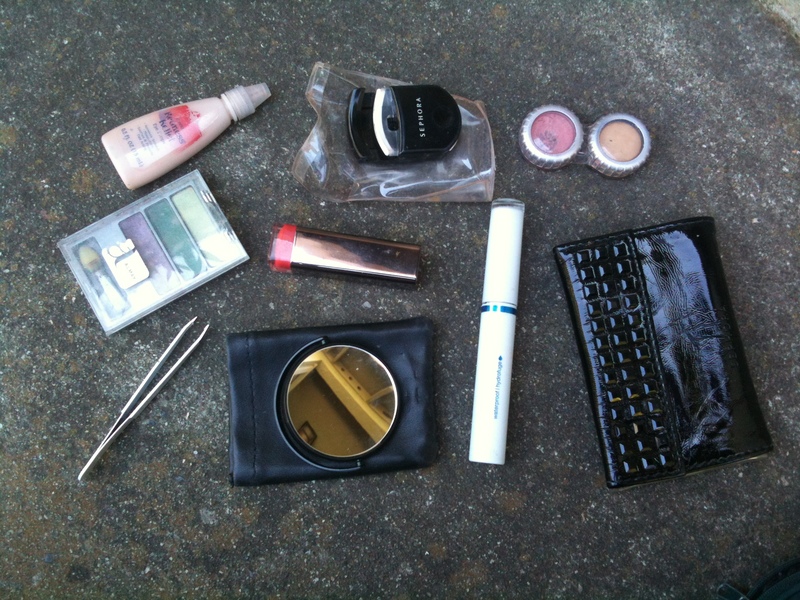 This is the contents of my travel makeup kit. Clockwise from upper left: liquid foundation, mini eyelash curler, contact lens case with cream blusher and concealer, travel makeup brush set, mascara, magnifying mirror, lipstick, tweezers, triple color eye shadow. Limit the makeup palette – If you have packed a capsule wardrobe you have already limited your colors. Restrict your makeup palette to match your capsule wardrobe. Leave the other colors at home. Use dual-use products – There are several products that can be used for more than one application. Consider tinted moisturizer or BB cream instead of bringing both moisturizer and foundation. Tinted moisturizer is usually lighter than foundation. You’ll appreciate this if you are going to be active or in a hot sweaty place. It also gives you a more natural look. Use a combination blusher/lip gloss. In a pinch, lip stick can also be used as blusher. Think lip crayons, lip pencils, or Nars multi-sticks. Use an oral syringe to decant liquid makeup into smaller containers. Use contact lens cases, sample jars, and eye drop bottles for liquids. Small bottles are available from the internet. 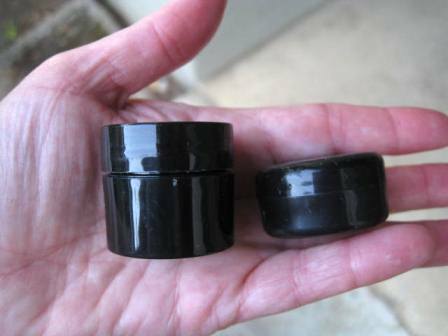 Use mini-sifter jars for mineral makeup. These are available via the internet. They come in 3, 5, 10, and 20 gram sizes for all of your makeup needs. Use free samples from makeup counters. These are often just the right size for travel. I hoard any tiny bottles and jars I get. I can put my favorite products in them later. 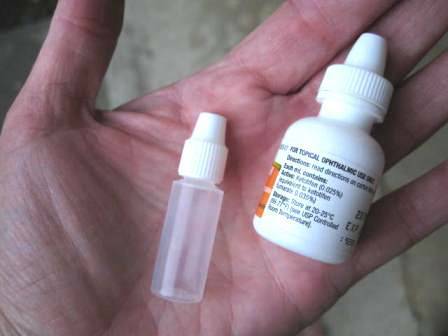 These tiny eyedrop bottles can be used to store liquids such as face serum and perfume. These sample jars are great for moisturizer or cleansing solution. Decant dry products to save space and weight. These mini-sifter jars are a great way to carry mineral makeup. Invest in a set of travel makeup brushes. Several stores sell them. Use a mini-eyelash curler. I have a small one by Sephora. 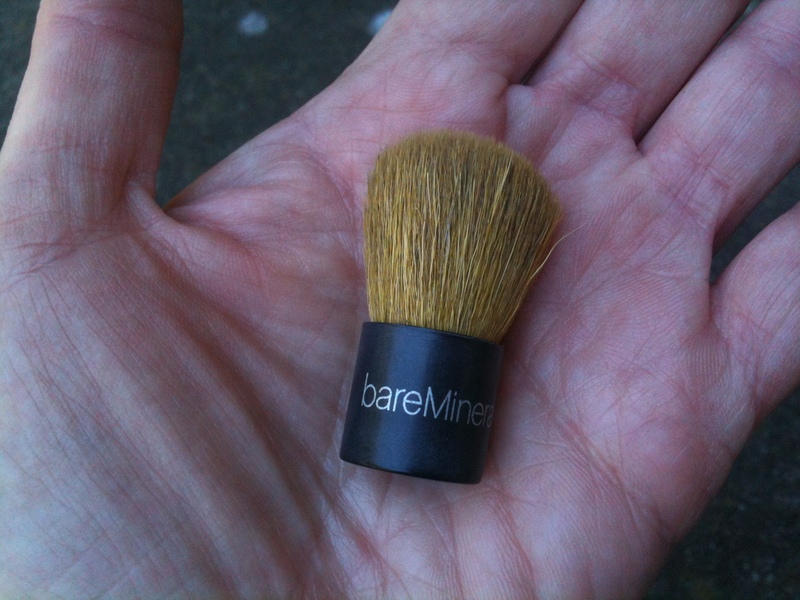 Use a mini Kabuki brush if you use mineral powder. 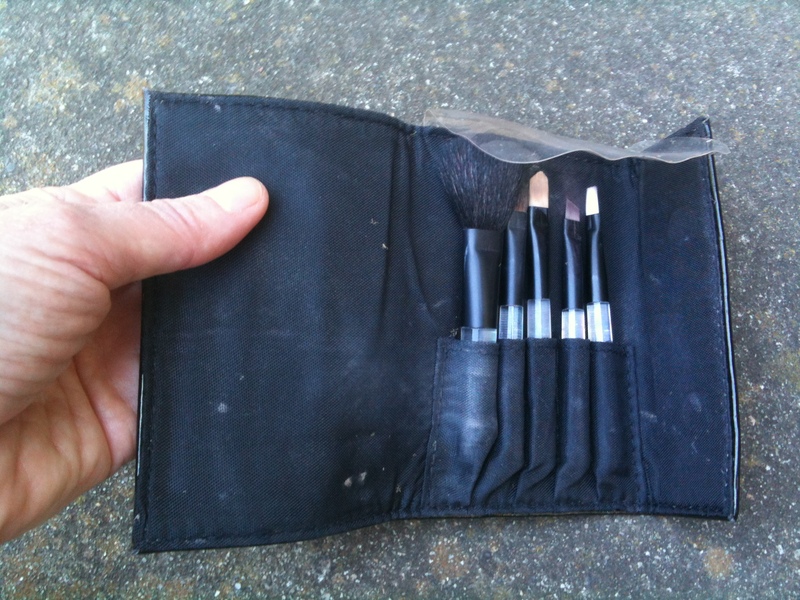 Many stores sell compact makeup brush sets that are excellent for travel. This one is from Sephora. This mini kabuki brush may be small, but it gets the job done. 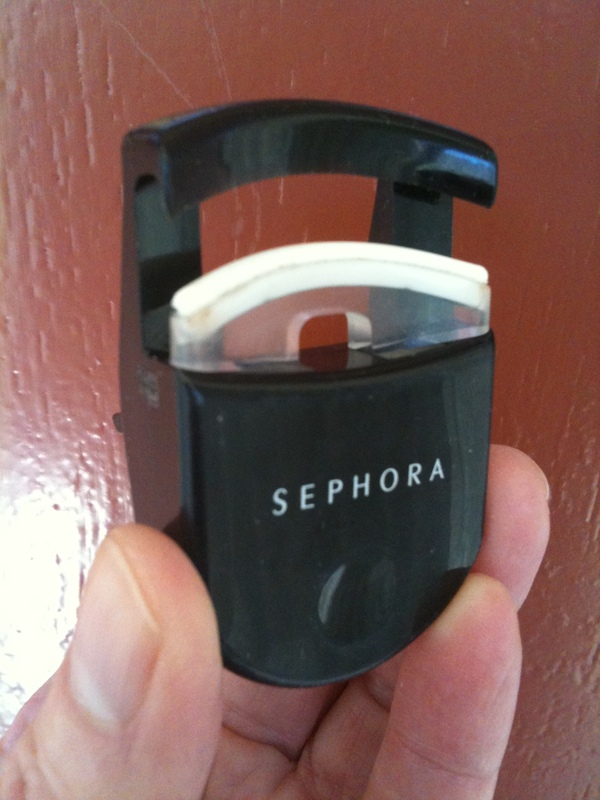 Sephora makes a compact travel eyelash curler. Several different kinds are available at beauty stores. These facial cloths are embedded with cleanser and toner. Just add water to activate. Use pre-moistened makeup removal pads such as the Neutrogena makeup remover pads. If you choose this option, only bring the refill kit – the plastic case is far too large and heavy for carry on travel. Slip the pads into a zip-lock bag if you are worried about the pads drying out. This is the heaviest option, and is bulky on a long trip. Use a “just add water” dry cleansing cloth. Unfortunately, these are becoming very difficult to find. 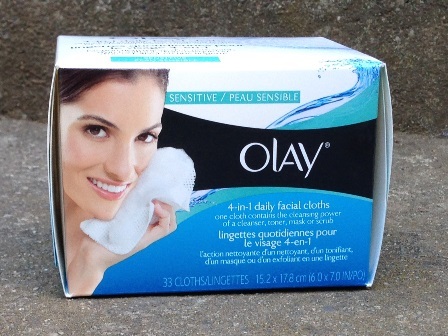 Most manufacturers are leaning toward the heavier pre-moistened towelettes. Updated September 14 2012 to include mini-sifter jars for mineral makeup. Updated August 25 2012 to include examples and makeup removal prodcuts. Tinted moisturizer is the best! The older I get the more I appreciate it. these are great tips (and I already use many of them), I also save the “free gift with purchase” from my favorite make-up lines that are offered periodically. I collect enough to make a complete care and basic make-up kit, and I’m always ready to travel. I too am a decanter! I’ve used contact lens cases for liquids such as foundation, great if you’re only going away for a day or so. i’ve not used them for solids though so that’s a great tip, thanks. The little sample pots you get from Sephora are great too, and you can fit a surprising amount in them. Where is your makeup bag from? I love it! Also, what would you say is the best liquid foundation brush? The bag is an old one from the drug store. I’ve been looking for a replacement and am having a hard time finding one that is small and light. I’ll have to look harder! I use a sponge to spread my liquid foundation on my face.